WASHINGTON -- First lady Melania Trump announced Monday that her son, Barron, will attend a private Episcopal school in Maryland, beginning this fall. The announcement answered one of the lingering questions surrounding the first family's unusual living arrangement. Mrs. Trump and 11-year-old Barron have been living at Trump Tower in New York since Donald Trump took office in January, while the president has lived at the White House. 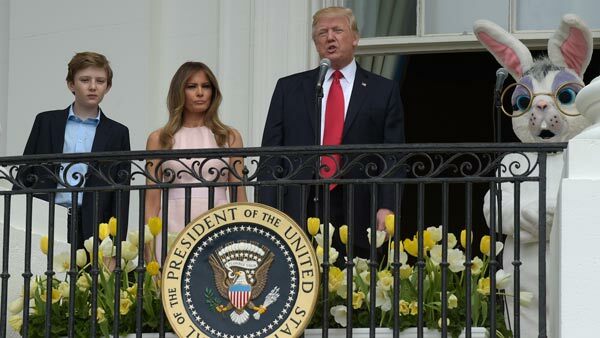 Trump has said his wife and youngest child will relocate to the White House after the current school year ends, which meant finding a local school for Barron. Mrs. Trump said Monday that they have chosen St. Andrew's Episcopal School in Potomac, Maryland, for their son. "It is known for its diverse community and commitment to academic excellence," she said in a statement. "The mission of St. Andrew's is 'to know and inspire each child in an inclusive community dedicated to exceptional teaching, learning, and service,' all of which appealed to our family." Annual tuition ranges from more than $23,000 for pre-K to more than $40,000 for students in grades 9-12. "We look forward to the coming school years at St. Andrew's," Mrs. Trump said. Founded in 1978, St. Andrew's, a day school, has a total enrollment of 580 students in prekindergarten through 12th grade, according to its website. Class sizes are small, with anywhere from 11 to 13 students, and all of its graduates go on to college, the school said. "As we came to know Barron through the admission process, it became clear that he, like all of our newly enrolled students, will be a great addition to St. Andrew's," school administrators wrote in a letter to parents on Monday. A spokesman said the head of the school, Robert Kosasky, would not have any additional comment out of respect for students' privacy. The school is known for research-informed teaching and the use of neuroscience and other brain-based research, both to help high-achieving students unlock their potential and to tailor education to children with learning disabilities or differences. Barron currently attends Columbia Grammar and Preparatory School on the Upper West Side of Manhattan. St. Andrew's is located in the wealthy enclave of Potomac, about 17 miles northwest of the White House and a 30-minute drive in light traffic. "School leaders are working directly with the Secret Service to ensure that ... logistics and security will continue to work smoothly and discreetly next year for all of our students and families," the letter to parents said. The Trumps' decision to send Barron to St. Andrew's marks the first time in decades that the school-aged child of a president will attend a school other than at Sidwell Friends, an elite Quaker school with campuses in Washington and Bethesda, Maryland. President Bill Clinton's daughter, Chelsea, attended Sidwell. So did President Barack Obama's daughters, Malia and Sasha. Malia Obama, 18, graduated from Sidwell in June 2016. She is taking the year off, what is known as a "gap year," before her expected enrollment at Harvard this fall. Sasha Obama, 15, is a sophomore at Sidwell Friends. Her parents decided to live in Washington after leaving the White House so she can finish her studies there. President George W. Bush's daughters had graduated high school and were headed to college when he was elected. President Jimmy Carter is the only recent president to send his child, daughter Amy, to a District of Columbia public school.